Datura is 30 to 150 cm tall, with erect, forking and purple stems. The leaves are large, 7 to 20 cm long and have irregular teeth a la oaks. The flowers are one of the most distinctive characteristics of datura. Being a leading firm in this industry, we are deeply engaged in offering a high-quality Datura Seeds. 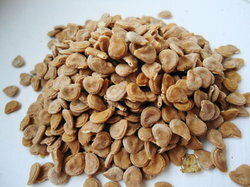 we are one of the leading manufacturer of Datura stramonium seeds. It used in ayurvedic medicine. With thorough expertise and understanding of this industry, we are enormously involved in offering a quality assured Datura Seed. In order to cater to the vast market demands, we are engaged in offering Datura Seed. With sincere intentions to preserve and uplift our reputation in the market, we bring forth a distinguished assortment of Datura Seed. We offer high quality Datura Seeds in the market. The Datura Seeds are obtained from the reliable source for their high quality. The Datura Seeds are suitable to be used in Ayurveda, Folk, Homeopathy, Unani and Sidha. We offer the Datura Seeds in proper packaging to assure safe deliveries. Datura Seeds are also known as Thorn-apple. They incorporate various medicinal properties. Datura Seeds that we offer are free from any contamination.